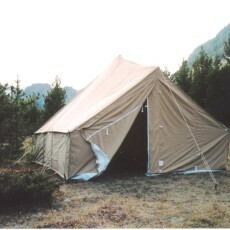 The Yellowstone Tent is uniquely designed for ease of set up, spaciousness, and stability. One person can set up a Yellowstone in less than 20 minutes. These tents have been field tested under severe conditions including heavy snow and high wind and have performed superbly. The key to the Yellowstone’s stability is its specially shaped overhanging roof design. This unique shape spreads out the forces created by the wind and other forces created by wind and other loads providing a very stable foundation. This overhang also protects the walls from exposure to wind and water. This allows us to use a more breathable construction of our 10.10oz. treated or 10.10oz flame resistant canvas, reducing interior condensation. 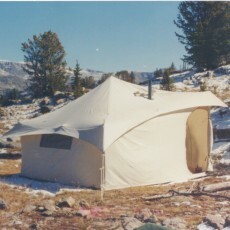 The Yellowstone is offered in a 12×12 or 15×12 size. Everything required to set up the Yellowstone is included with the tent. The 1 1/4″ heavy wall aluminum poles break down for ease of packing. 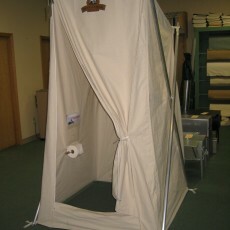 Screen windows with zipper flaps, a zipper door, sod cloth and stovepipe shield, with flap are all-standard. We also include the ropes, 12″ hook stake, a tent bag and a pole bag. It is 7′ 6″ Door Corner High (all other corners are 5′ high). 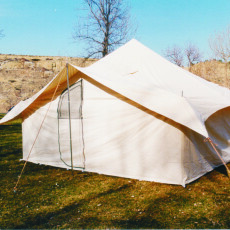 Over half a century of tent making experience has gone into the Yellowstone construction. We have combined traditional and modern materials and techniques in reinforcing and strengthening areas of stress. 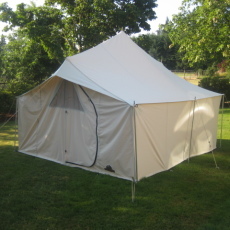 We believe that no corners have been cut in producing this tent. I have a Yellowstone 12 X 12 and regularly camp at the Texas Coast at Padre Island National Seashore. The longest undeveloped barrier island in the world. Rain, wind and severe thunderstorms I’ve seen it all and my Yellowstone take all comers. GREAT TENT and big enough for me my kitchen and three Germans Shepherds! !